In the 1940's Aluminum siding was developed for homes in the United States because it was considered to be a low maintenance alternative to wood clapboard siding. There were several benefits of installing aluminum siding including the fact that it was lightweight, and the paint finish was baked-on. No painting was necessary. Back in the day it was a popular option among homeowners. During the 1970’s, the cost to manufacture aluminum siding had increased significantly and vinyl siding had proven itself to be the future of low maintenance house covering option. There are obviously millions of homes that were built between the 1940’s and the 1970’s and chances are good that the exterior is covered with aluminum siding. Many people have discovered, there are some problems that are inherent with aluminum siding. The biggest problem is the fact that the coating that is baked on the surface of the aluminum and it has a tendency to chalk and fade like it's nobody's business. What can you do when it’s time to bring the exterior of your home up to speed? Is painting the aluminum siding a good idea? Can you paint it or should it be replaced with new vinyl siding? when properly cleaned and prepared, paint will adhere to aluminum siding. And painting your home will always be less-expensive compared to replacing the siding. It is critical to first remove any chalk and mildew from the surface so that the paint will properly adhere. 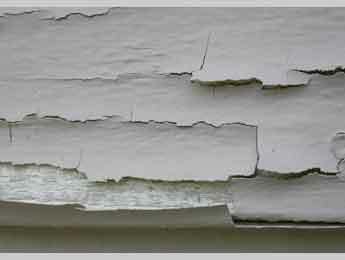 A quick check for a chalky surface is to move your hand across the surface of the siding. Observe your palm. If there is chalk then it must be removed before any paint application process can proceed. This can be accomplished by power-wash cleaning and using bleach or an aluminum siding cleaning product. In some cases, a scrub brush with an abrasive sponge and some good old fashioned elbow grease could be necessary. These cleaning products are specially made to remove the layer of chalk from the surface of aluminum siding. Davinci's are Painters in Vienna Virginia and we include power-wash cleaning as part of the preparation process for all of our exterior projects. If the paint on the aluminum siding is baked into the material from the factory then there would not be a problem about any peeling paint. But if the coating you’re painting over is not the original finish, make sure you scrape any loose or peeling paint, and sand any uneven edges. 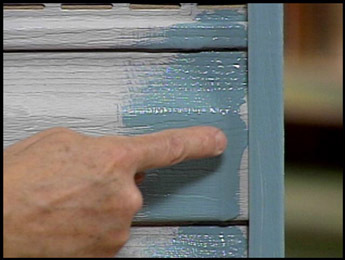 Many good quality paints can be applied on top of aluminum siding without the need for a primer. Make sure you read the manufacturer’s recommendations on the can before you start your project. Then apply two coats of a 100% Acrylic Latex Paint by whichever application method that is recommended. As the temperatures go down and the days get shorter, the increasing energy bills give us more motivation to get our homes ready for winter. Improving the insulation of your home is a good idea, but there are also some additional winterizing tips that could save you some serious bills and problems with your home. Some of the problematic areas found in many homes are the windows and doors. Cold air often goes through the cracks and often times drafts are created. One can test this by using an open hand to check the edges of your doors and windows to see if any cold air can be detected. A candle could also help you find cold air drafts. If you see any cracks around the trim or frame of a window, it is best to seal them with caulk. If a door is not sealed well, install weather-stripping to close the gaps. Also, if there is a draft under the bottom of a door, a draft-guard or threshold would be able to seal the space. An alternative solution would be to have your doors or windows replaced to a more energy efficient model. This would also bring-up the value of the home while at the same time save money in the long run by reducing heat loss. If you have any exposed pipes in an un-insulated area of your home, such as a basement or crawlspace, you should to insulate them. Also disconnect and drain any garden hoses and put them away. If your exterior water faucets are not a anti-freeze type, then install insulation caps on the faucets to protect them. If your gutters and downspouts are clogged with debris, it is imperative to clean them out. 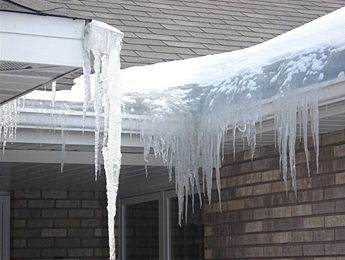 Other methods are available which will prevent gutters with poor drainage from becoming blocked with ice. Over time, this issue can create leaks in roofs. If you don’t have the time or cannot perform these maintenance activities on your own, you may want to consider hiring a professional. Davinci's Painting Company has extensive knowledge and experience to protect and seal exposed the wood surfaces of your Home. We also offer complete interior services to get your home ready for the holidays.